These arrived today and I fell in love with the colors in the bottles. I also did a picture comparison with Orly. The overall formula for MAC is thin and runny. That being said, it dried quickly. This is an image heavy post…you have been warned! 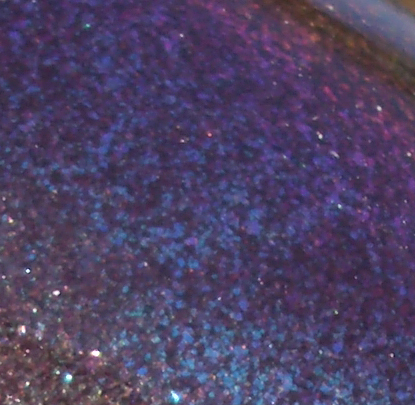 I tried to best capture the shimmers of the polishes. There really is no discernible difference between the two, is there? Even the size of the glitter, etc. M&G is a bit thinner than SC. 3 coats of each. Up close shot of the bottle. MAC’s formula is thinner and runnier than Orly. You can see it. Other than that, no real discernible difference. This is 3 coats of each polish. 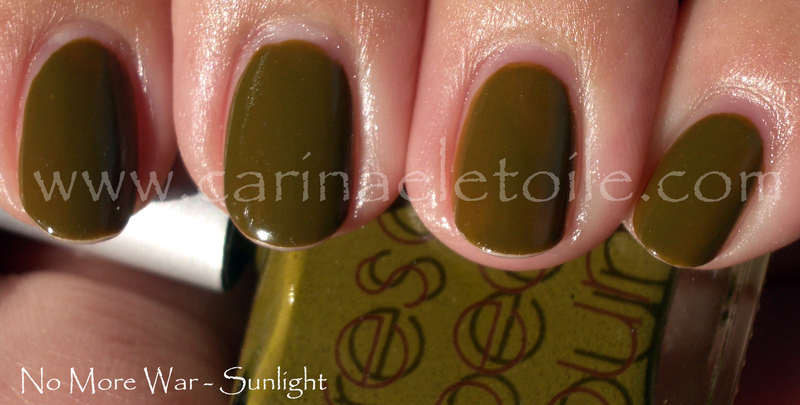 This color was another one that I was looking forward to when I first heard about MAC’s fall 2010 collection which they called Nail Trend. I don’t know if it’s really a trend…nor do I know if it’s really a collection I’m pleased with. I’m a creme kind of girl and I was hoping for one stand out, much like last year’s much beloved (by me!) Dry Martini. I regret not getting a back-up bottle of that. I’m just grateful I got a bottle. Anyway, this color was so promising in the bottle. But in the back of my mind, I kept hearing, “OPI did it better with Russian Navy…OPI did it better with Russian Navy…” And ya know what? OPI did it better with Russian Navy. The one thing that MAC got right over OPI was the formula. It wasn’t a pain to deal with. If anything, it made me really sad because the formula was so wonderful while the color itself was kind of…meh and uninspiring. From far away (and at night) the color looks like a dark creme. Even in fairly direct lighting, it still looks like a dark creme. 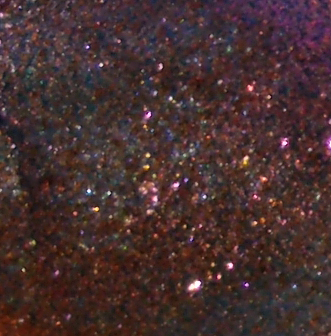 Heck, even in my pictures it looks like a dark creme that had some glitter spilled into it purely by accident. Please overlook the tip wear – it’s going on…day three (I believe) in the picture. 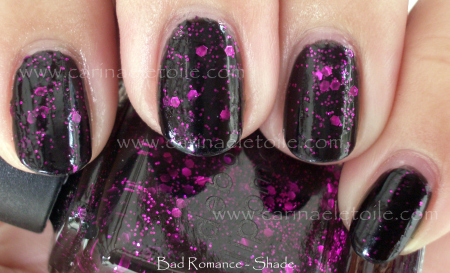 *cough* very OPI Lincoln Park After Dark, don’t you think? 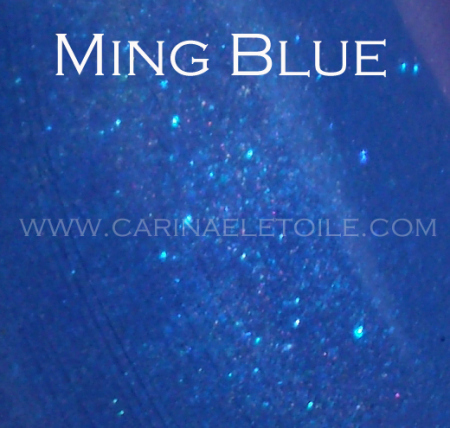 I’m currently wearing this blue on my nails. I have been for the past few days. I neglected to take a picture until yesterday so please pardon the tip wear. 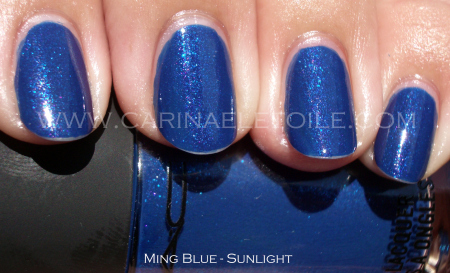 I like blues like this and the only thing I wish MAC had done was make this polish bolder. Maybe the glitter in it a bit more big and boomin’, ya know? This was opaque in two coats and it dried quickly. However, much as I did enjoy this color, it didn’t live up to the hype I had put in my head for it. Don’t get me wrong – I do like it. I just wish it had wowed me a bit more. As always, keep clicking the pictures to enlarge until they can enlarge no more! The actual sizes are huge and these are just thumbnails. I won’t go busting into a rendition of Bad Romance for you. I will show you pictures instead. 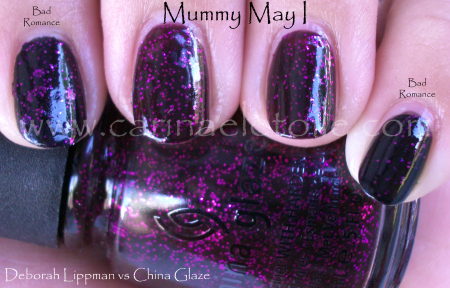 Deborah Lippmann’s formula was a bit more jelly-like than China Glaze’s. However, in three coats BR was a bit more opaque and darker, coming across more on the black side than a jelly. China Glaze’s came off as a dark brown. 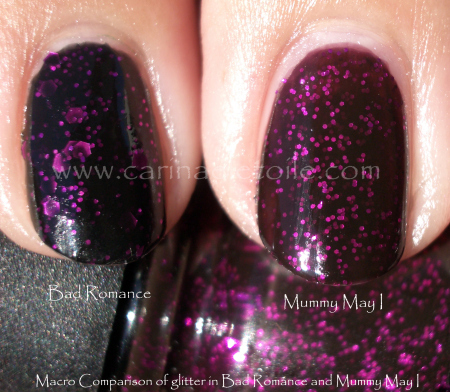 The colors of the purple glitter are similar, but BR has the awesome hexagonal shapes while MMI has plain circles. Good news on both colors? Fast drying. No jacked up brushes. However, both were three coaters because I didn’t get the initial color I wanted. Both of these applications were three coats. This blue is amazing. 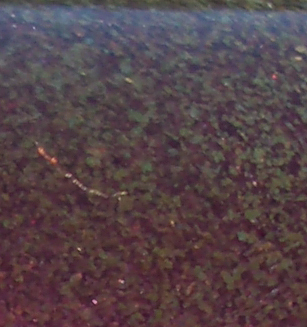 I wasn’t able to capture the gorgeous purple shimmer that was in it. 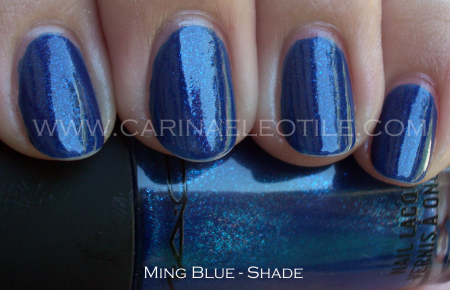 I get compliments on it – even from people who don’t like blue nail polish. I love this color and I wear it whenever I can, even bumping aside tried and true colors that I wear. I have to get a back up for this one, too! 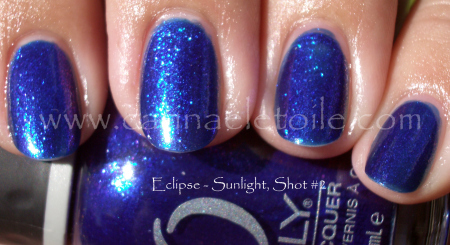 This lovely polish is part of Orly’s Cosmic F/X for Fall 2010. 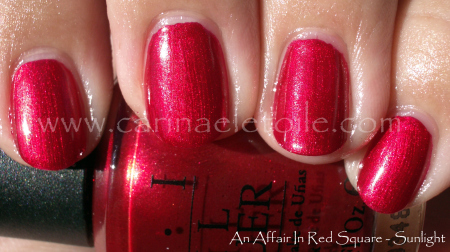 The formula is amazing – quick drying and opaque within two coats. 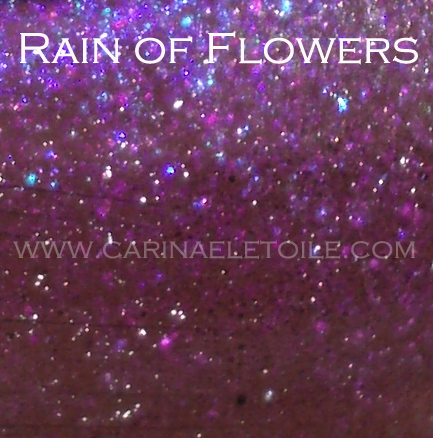 In the shade shots you can see the gorgeous purple shimmer in the bottle, but it didn’t translate well into the picture, but in real life the purple shimmer/flashes were just…amazing. This is definitely a color that’s well worth the purchase. The sunlight drowned out the purple shimmer, but it is there! But it’s just beautiful, isn’t it? I finally found this color amongst some other bottles I hadn’t sorted and organized…and it’s a pretty one, isn’t it? I still prefer cremes and I think this would’ve been a lot better had it not been for the shimmer. It’s a bit on the pink side and I’m fairly ok with that. Formula was good, but the brush was jacked up. I took a picture of the brush, meaning to post it. I’ve decided that I will post pics from here on out of my OPI bottles with messed up brushes because I find it’s OPI who has the worst quality control when it comes to their brushes. I missed the boat on the first round, but when Rescue Beauty Lounge No More War was re-released you can bet I was all over it. I am so glad I did. While some hated Rescue Beauty Lounge No More War, on me when I was wearing it, I liked it and didn’t really care what others said. I didn’t count on posting 3 Rescue Beaty Lounges in a row, but in case you can’t tell I am a huge fan. 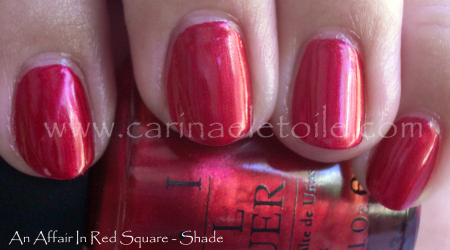 Formula on this was a bit runny, but it was opaque in two coats. Please don’t mind the heavy handed application on the ring finger. Loved that this dried super quick. I was done in under half an hour – that’s pretty darn good. 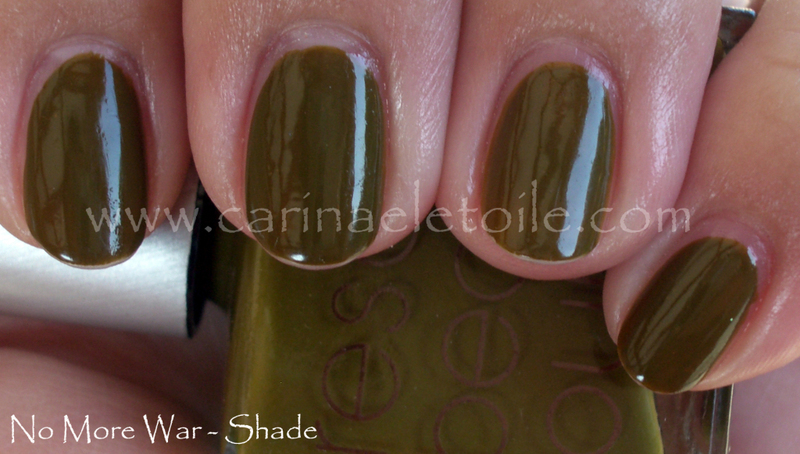 I know a few bloggers who are not fond of shades like this. They call them ‘poo’ colors. I saw this and just thought, “What a pretty olive green this is…” I’m so glad that I totally scored Rescue Beauty Lounge No More War. Now that you’ve seen Rescue Beauty Lounge No More War, do you feel like you’ve missed the boat on this? Will you be trying to find a way to get your hands on a bottle?